Brad composited this shot of the MiG-23. The guy on the left is Jon. The guy on the right is Jon's evil twin. Maybe it's the other way around? This shows one wing in full sweep and one in medium sweep. The hydraulic ram which pivots the wings has not been attached yet (as we are still working on connecting all of the fluid lines, etc.) and the wings can easily be moved by hand. 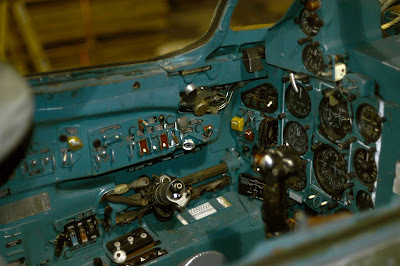 He also took this beautiful shot of the cockpit, which shows how far we have to go before everything is labeled in English.